During World War 2, almost all of the captured German spies were taken to Cannon Row Police Station in London for a preliminary interrogation/statement. Josef Jakobs, who arrived via parachute on January 31, 1941, was no exception. After a cold night in a potato field near Ramsey, nursing a broken ankle, Josef was discovered by the local Home Guard and taken to Ramsey Police Station. After being processed by the Ramsey Police, Josef was transported to London on the afternoon of February 1, 1941. Many of the German spies had been told by their handlers that London was a bombed-out wreck, but as Josef was driven through the streets of London, he would have realized that the Abwehr spymasters had been lying. Josef's escorts may have driven down Whitehall Avenue, passing Trafalgar Square enroute to Derby Gate, just past the Horse Guards Parade and No. 10 Downing Street. Turning left off of Whitehall/Parliament Street, Josef may have seen the Red Lion pub crouched on the corner of Parliament Street and Derby Gate. The Red Lion was an iconic place. It could trace its roots back to a medieval tavern built on the site in 1434. Over the centuries, the pub acquired the name Red Lion and ales were downed with enthusiasm by many illustrious folk. Charles Dickens had been a regular visitor back in his day. 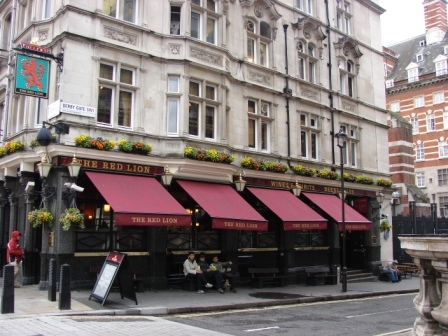 And, sitting so close to Downing Street and the Houses of Parliament, the Red Lion was a popular watering hole for British Prime Ministers, including Sir Winston Churchill. Perhaps, on that gloomy February evening, as Josef's transport turned into Derby Gate, Churchill sat in the gloomy interior of the Red Lion, sipping a rationed ale. But Josef was to have no ale to ease the pain of his broken ankle. His destination was just around the corner, Cannon Row Police Station. The imposing edifice of Cannon Row Police Station had been built between 1898 and 1906 with Flemish and Baroque embellishments. It was constructed as part of an expansion of New Scotland Yard (constructed 1887) and was given the police station code letters "AD". Each London police station had a two letter code, and in the case of Cannon Row, the AD was often expressed as Alpha Delta. The station was responsible for policing Buckingham Palace, Windsor Castle, The Palace of Westminster (Parliament), No 10 Downing Street, Clarence House, St. James' Palace. It was also responsible for all major events and demonstrations that took place in Central London. The more familiar name of Cannon Row Police Station was a reference to the small street that ran south of Derby Gate in the direction of the Parliament Buildings. The little street of Canon Row had originally housed the canons of St. Stephen's, Westminster. By 1941, however, the canons were long gone and the name had morphed a bit. Today, you will find reference to Canon Row Police Station as well as Cannon Row Police Station. When Josef arrived outside the doors of the police station, he was carried inside on a stretcher and taken to an interrogation room. After an inspection by the Police Doctor, Josef was proclaimed fit for questioning, a task carried out by Major Thomas Argyll Roberston, an officer of His Majesty's Forces, and a member of MI5. Robertson was in charge of double agents, and it was his job to determine if Josef was suitable double agent material. Based on Josef's voluntary statement, Robertson concluded that Josef was indeed a malleable prospect for double cross work, the only hiccup being his rather nasty ankle fracture. It was this, more than anything that would eventually force MI5 reluctantly move Josef's name from the potential-double-agents list to the candidates-for-execution list. After his questioning, Josef received an injection of pain medication from the Police Doctor and was transferred to Brixton Prison Infirmary. Josef would visit Cannon Row one more time, in June 1941, when he would make another statement to an MI5 officer, this time Lt. Col. William Edward Hinchley Cooke. Many other spies would make statements to Hinchley-Cooke within the walls of Cannon Row. Most of those spies would find themselves destined for the gallows. Cannon Row Police Station was eventually closed in 1992 and the members of that station amalgamated with the Bow Street Police Station. But the imposing building still remains, crouched on Victoria Embankment.